First look at Sinon and human-size Yui, as well. The latest set of Sword Art Online: Lost Song screenshots introduce the game’s base city, the Sky City of Line, as well as online multiplayer, Sword Skills, and new characters Sinon and human-size Yui. 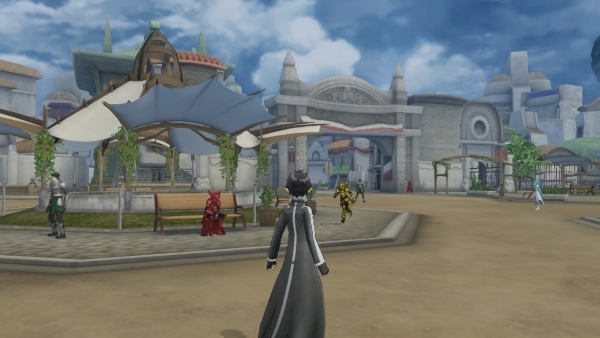 Sky City Line is the center of Lost Song‘s story, where various stories will begin. Here, you’ll find a weapon and workshop, and other businesses and adjoining buildings. In the Town Square, you’ll find various ALfheim Online players mingling. The town inn is Kirito’s base, where players can deposit items and adjust equipment. At the weapon and workshop, headed by Lisbeth, players can customize and enhance all kinds of weapons. And at the tavern, players can gather various information and take on quests. A portal is available in Sky City Line that will transfer players to each floating island. Form your party in the town, prepare your equipment, and embark on your adventure. Up to four people can play together online. Choose a quest and cooperate to clear the mission. Players can pick which character they’d like to play as. Each weapon has its own set of Sword Skills. Ranged attacks, consecutive attacks, etc. use them properly based on the situation. The press release also clarifies Yui will not participate in battle. Sword Art Online: Lost Song is due out for PlayStation 3 and PS Vita in Japan on March 26. An English localization is planned for Asia.